The Reframed Stories Project asks people to respond to dominant themes and issues that appear in news coverage about their communities. These stories are reflections by people who are frequently represented by others in the media. Word clouds are created using the Media Cloud platform, a data analysis tool which examines a collection of media outlets over a specific period of time, allowing participants to analyze and discuss the preliminary insights into how they might be represented in the media. The project refrains from making conclusive pronouncements about the data, and instead is a starting point that creates space for discussion about how they can help shape their own media representation through digital media. 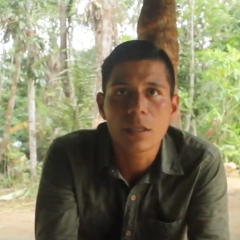 Julio Santi is a member of the Kichwa Peoples of Sarayaku located in Amazonian Region of Ecuador, and which has held long fights at a national and international level to stop extraction projects in their territory. The following is a transcript of the video of Julio's comment about the word cloud for the term “Selva viviente,” (Living Forest) which is a way of life to live together with nature. Within the word cloud, the term “Sumak kawsay” (good living) attracted Julio's attention. De estas nubes de palabras he escogido el [término] “sumak kawsay” (buen vivir) porque sarayaku mantiene su tradición histórica vivida dentro del pueblo. No queremos contaminaciones, que nos vengan a contaminar nuestra selva y nuestros ríos. Sobre todo queremos una vida digna de paz y armonía. Lo que queremos es que en esta nube de palabras aparezca nuestras costumbres, nuestra cultura, nuestras tradiciones y nuestra forma de vivir. From among the word cloud, I chose [the term] “sumak kawsay” (good living) because Sarayaku maintains its historical traditions that live within the people. We do not want contamination, we don’t want them contaminating our forest and our rivers. Above all, we want a dignified life of peace and harmony. What we want [to appear] in this word cloud are our customs, our culture, our traditions, and our way of life. This is part of a Rising Frames series developed as part of a workshop organized by the Communications Department of Sarayaku on May 17, 2018 that brought together youth members of the community to examine how they or issues they care about are represented in an Ecuadorian media collection. Following the discussion, they created stories in response to that representation. One of the workshop facilitators, José Santí participated earlier in the Reframed Stories Project and wrote his own story about the representation of Sarayaku.